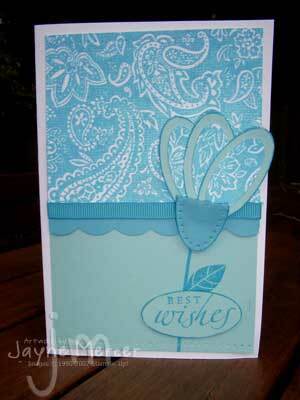 Stampset: Bodacious Bouquet, Fine lace background, Stem sayings. Cardstock: Basic Black, Old Olive, Purely pomegranate, Ballet Blue, Lavender Lace. Ink: White craft, Purely pomegranate, Ballet blue, Old Olive. Other: Crimper tool, Old Olive grosgrain ribbon, Dimensional adhesive. Technique: Kiss – off stamping.